In these lessons, we will learn some models for decimals, how to write decimals in expanded form, how to compare and order decimals, how to estimate and round decimals. 1. Using decimals extends the place value system to represent parts of a whole. The use of a decimal point is a symbol that separates the tenths from the ones, or the 'part from the whole'. For example, in the number 4.2, the decimal point separates the 4 ones and the 2 tenths. 2. The base ten place value system is built on symmetry around the ones place and the decimal. 3. Decimals can represent parts of a whole, as well as mixed numbers. 4. Decimals can be interpreted and read in more than one way. For example, 4.3 may be renamed 43 tenths. 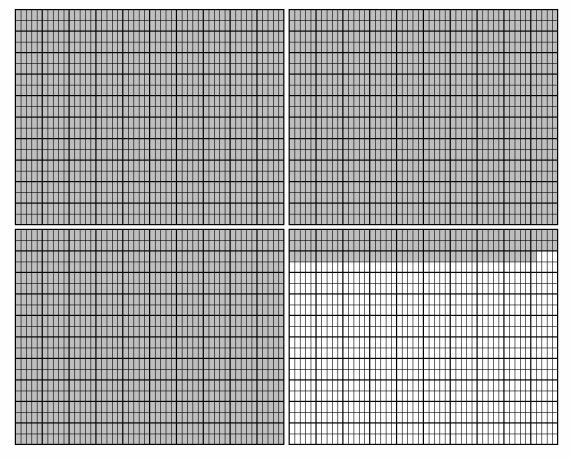 We can use a thousands grid to model decimals. 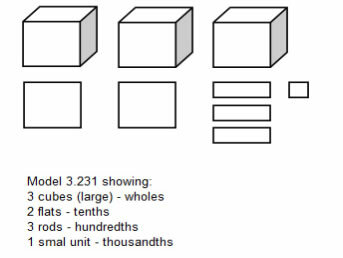 We can also use base ten blocks to model decimals. Meter sticks can also be used to represent decimals. Measuring to the nearest millimeter is one thousandths of a meter. Centimeters are hundredths of a meter and decimeters are tenths of a meter. Model decimals on grids and on number lines. Using a model of a garden, students develop an understanding of tenths and hundredths places, as well as relate decimals to fractions and percents. A decimal can be written in expanded form. 45.23 = (4 × 10) + (5 × 1) + (2 × 0.1) + (3 × 0.01). 50.302 = (5 × 10) + (3 × 0.1) + (2 × 0.001). 0.8 > 0.423 because 0.8 is more than half and 0.423 is less than half. We can round decimals to simpler decimals.